Hello 66Overlander, just wondering if you were able to get anything on my 1966 safari, with the numbers #31913. Hope you are doing ok, since we have not heard from you since June 4th. Thanks for the concern. I am fine, but have been travelling most of the summer without my resources with me. Will eventually get to looking up old numbers, but not for a while yet. WBCII Number on 1969 Overlander? New member hoping to land a big silver fish this weekend. Curious about any historical info you might have on a '69 Overlander 27-footer with the double bed on one side of the "hallway" and cabinets on the other. #20262. Thanks! The number (20262) belonged to a WBCCI member, not the trailer. WBCCI typically does not give out member information, and they reassign numbers after a period of non-use. The number may be active now, but may or may not be the same person as owned the trailer you are interested in. i have a 66 Ambassador with what seems to be a very low Wbcci number. Is any info available on number 739. I will chime in here with another possible request.... we just purchased a 1962 Safari a super project trailer... (we've been there done that...) but the shell is great. She has some WBCCI numbers under a couple of layers of (gulp) paint on the roof. Just wondering if there is any information on the numbers, I know there might be a name in an old registry.... it is an Ohio made trailer and we think originally or early on was sold in New York state. Just thought it would be fun to know! So if anyone can assist we would be very appreciative! Spring is finally coming... and we are anxious to hit the road! Hope everyone has safe travels this year! If anyone has information on these numbers we would appreciate it, curious! I used to try to answer these questions within a reasonable time, but life has become too hectic lately and I see that I have not answered any of these requests in this AirForums thread for about a year, though I have answered some via email over the last year. Hi, any info on my 74 Ambassador? 2735!Im making her my home, one rivet at a time! #2735 was unassigned in 1998 thru 2002. It was then assigned to a couple from Texas for a few years, but I am withholding those details because that is too recent to post online. I spot checked a few years into the 2010's and did not see the number reassigned, but it may have been for a year or two. So what can we guess? Obviously the Hudsons joined WBCCI in 1971 (thus being listed in the 1972 Membership Directory) with an Airstream earlier than your 1974 Ambassador. They obviously took this earlier Airstream on the 1972 Mexico Caravan. At some point they may have upgraded to your 1974 Ambassador, possibly when new, or possibly years later as a used trailer. They may have taken it on some or all of their WBCCI caravans. Or maybe not. Possibly the couple from Texas owned your Ambassador. Or maybe not. Given that this number has been assigned to club members in the FL/NC area and the TX area and you are from OR, I have no good guess who may have previously owned your 1974 Ambassador. Maybe paperwork in the trailer or dealer decals/badges on the trailer might indicate a previous history in FL, NC, or TX. That will be up to you to determine. Sorry that I could not provide a more solid educated guess. Enjoy your Ambassador! I think this is enough work for tonight. Maybe I can get to another request tomorrow. Hello Joe, glad you are back, hope you get better soon. Thanks for helping folks out on this! I know everyone appreciates your efforts! Yikes, I hope you feel better soon! We just purchased a 1970 Overlander this past weekend. Ive read a lot about the ghost numbers and would love to find out about ours. Our number is 22479. If anyone has access to a directory and wouldnt mind looking it up for us, we would be so grateful! Thank you! 1970-92: Kenneth & Beatrice Dehaven, Orlando, FL, no caravans. 1993+: Unassigned, only spot checked a few directories, but unlikely to have been reassigned in the directories I did not check. Thus we can be pretty sure the Dehaven's owned your 1970 Overlander. I would guess they bought it new and immediately joined WBCCI. I cannot say if they owned it thru 1992, or perhaps if they upgraded to a newer Airstream at some point during their time in the club. That's all I got. Not idea when or how it made it's way to Alabama. Have fun with it. 1970 Airstreams are a nice transition year between the wooden cabinets of the 1960s and the tambour (roll up) door interiors of the 1970s. I'm new here and just started a project that I posted over in the 1968 Overlander section and a few said come over here an ask. We just picked it up after sitting in the woods for many years and the Ghost number is 3594. Any info at all would be much appreciated. 1960-73: Dr. Frederick & Anita Barr, Dayton, OH, no caravans. 1976-79: Marvin & Betty Hoke, Dayton, OH, no caravans. 1987-98: William & Gloria Hock, Independence, MO, no caravans. 1999-2000: Unassigned, did not check further as the numbers clearly look like they are not newer than the 1990s. What can we guess? The Barr's obviously joined the club with an Airstream older than your 1968 Overlander, but they could have upgraded to your trailer during their time in the club. Or maybe not. 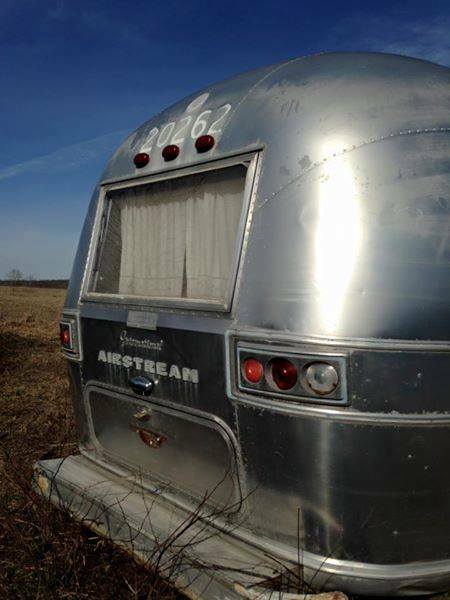 I might guess that the Barrs and Hokes might have owned the same Airstream as they had the same WBCCI number assigned only a couple of years apart and lived in the same city. That could be your Overlander, or maybe not. Doubtful the Hocks owned the same Airstream as the Barrs and/or Hokes. Overall, since you are in Connecticut, I might guess that it is slightly more likely that the Barrs and/or Hokes owned your 1968 Overlander rather than the Hocks, but mainly because Ohio is closer than Missouri. Perhaps paperwork you got with the trailer or a dealer decal/emblem on it might point to it previously having resided in Ohio or Missouri. That's all I got. Enjoy your Overlander! 1980-84: Basil & Martha Moncrief, Corpus Christi, TX, no caravans. 1985+: Unassigned, but only spot checked a few directories. Thus is seems almost a certainty that the Moncriefs owned your 1966 Safari in the early 1980s. That seems reasonable since they and you are both from Texas. Unfortunately, that is all I can tell you. Thanks for your patience waiting for an answer. Have fun with your Safari!